Serving Saratoga, Ballston Spa, Burnt Hills, Galway, Malta, Schenectady and everywhere in between! Cunningham's Ice specializes in the manufacture of both cubed and blocked ice. This Ballston Spa, NY based business has been serving the public since 1975 and is constantly striving to provide the best ice cubes and ice blocks around! 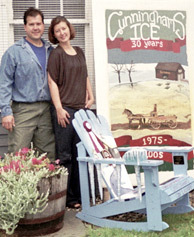 Cunningham's Ice operates all year long and produces their own ice, so there is no second guessing the quality of the ice. The ice cubes and ice blocks are prepared and packaged by hand daily and is available for pick-up or delivery (depending on the quantity). This highly visible corner was originally started as a Chysler Plymouth dealer in 1950 by the Cunningham brothers and turned into a laundromat in 1961. The Ice business was established in 1975. We purchased the Cunningham corner at route 50 and East High Street in 2003 and operate Cunningham’s Ice along with the coin laundry and a 3 bay auto repair and sales business. Q. Are you known for anything special? Cunningham’s corner provides customers with the ability to do their laundry, have their vehicle serviced as well as picking up ice for the family function all within a short amount of time. We produce and supply local businesses with seven and twenty pound bags of cubed ice in ten pound blocks. The ice business operates year round. It becomes very active from May to September at which time we are open 7 days a week. Q. What is it that you like most about your business? We enjoy servicing local residents of the community and developing a network of acquaintances. Q. What is the biggest challenge in your business? Our biggest challenge is keeping our customers satisfied by providing service and maintaining top of the line equipment. Q. What do you want the community to know about you? 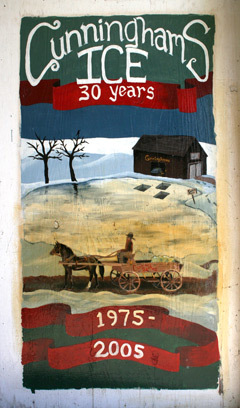 We have lived in the area our entire lives and strive to supply the community with high-quality products and services. We attempt to also make the businesses appealing to those who enter Ballston Spa from its Southern gateway. Cunningham's Ice also provides exchanges on propane tanks. If you feel the grill is running low this summer, make sure you stop by Cunningham's for an exchange! Come Visit Us! On a hot sunny day and get cold! Cunningham's Ice is stocked and ready to help cool things down for your special event. Whether you are throwing a large party or just need ice at home, Cunningham's has it! Contact Us Call your order in and we'll have it ready! Need ice for a small, medium or large event? give us a call and we'll make sure your order is ready when you get here. We also offer delivery for larger orders!